Wow! I just made my biggest guitar purchase yet... a V.O.S. 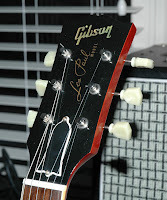 (Vintage Original Spec) 1959 Gibson Les Paul Standard, Cherry Burst (a.k.a., the "R9") with a beautiful flamed top! This guitar is absolutely ridiculous in every way. The tone is unreal, the top is gorgeous, the neck feels awesome and the weight is just a touch heavy at 9.12 lbs., but I don't mind heavier guitars. I went to Guitar Center just to check this guitar out because I have been reading a lot about the R9 Les Paul lately and I had remembered seeing one at GC the last few times I was there. So I plug it in and start playing and find that I really like the bigger 50's style neck, and the fret work (which is done with a Plek system) is superb. This must be the smoothest, most accurate fretwork I've ever had on a guitar (thanks to the Plek)... and it is a really pleasure to play. Unplugged this thing is loud and resonant, and plugged-in the tone is very well balanced. It has a round, warm tone overall with plenty of mids and a nice spike of upper mids that really help to keep the sound even keeled. I simply haven't stopped playing it since I got it. The overall fit and finish is good. There are some flaws, but that is to be expected. The R9s come with a slightly distressed finish and aged hardware (pickup covers and bridge). It looks and feels like a well worn, played-in guitar. The Gibson V.O.S. series is very similar to the Fender Time Machine relic collection with the main exception being that Gibson only offers one level of lightly aged guitars instead of the several levels of aging that Fender offers. I cannot stress enough how much better these Custom Shop instruments are than the regular production stuff. That goes for Fender as well as Gibson. It is well worth the extra cash for these guitars. So far this might just be my favorite guitar, ever. It looks hot, plays great and sounds unreal. Those are the ingredients for "mojo", my friends.... when a guitar has the look, the feel and the tone that just draws you to it over any of your other guitars, you know it is special. Well, I couldn't resist getting this guitar once they got me to play it at my local Guitar Center. I didn't think I'd care that much for it, but once I plugged it in I couldn't believe how well it played and sounded. The ES-339 is a Memphis Custom Shop based on the larger ES-335 semi-hollow electric guitar, but is smaller and lighter than its larger sibling. In fact, it's about the same size as a Les Paul... yet it still retains the same fat tone that the larger ES-335 is famous for! A pretty amazing feat of guitar design. I briefly had the Vintage Burst 339 (pictured left), but after I got it home and began setting it up I realized that the neck had a hump in it starting at the 12th fret. It was a really bad case of "rising tongue", which is when the fretboard inclines upward on the high frets. This is a very undesirable condition and so I returned the guitar to Guitar Center, only to find out they had just taken shipment of another 339 that hadn't even gone out to the floor. This one was the Antique Red that I now have. After careful examination and many hours of playing I am satisfied that this one is an excellent specimen. Gibson put their '57 classic humbuckers in the 339 with the "Memphis Tone Circuit" (basically a capacitor that preserves high-end when rolling off volume) . The tone of this guitar is just spectacular. It is exactly what you'd expect of a good ES-335, warm fat tone on the neck pickup, which can really fatten up with the tone control for smooth Jazz... and a nice aggressive, punchy bridge pickup that can do everything from dirty blues to compressed 80's shred distortion. In a word, this thing is "versatile". Plus, the Antique Red is simply a gorgeous finish that really gives this guitar a classic look. The neck feels unlike any neck I've tried. It is super comfortable, however, the fretboard feels a bit crowded up high for my big fingers, but I still manage to solo on the high frets just fine. 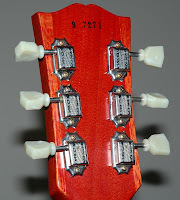 My guitar has the slimmer 60's profile neck, but the 339 is also available with the fatter '59 profile.